Puzzle Maker | Mac App Storeのアプリ検索・ランキング BuzzMac! Use the grid editor to design your puzzle. Use the Inspector to set colors, fonts, and layout. Use Puzzle Maker's advanced algorithm to automatically create crossword and word searches for you. For crosswords, Puzzle Maker can find dense word clusters and maximizes the number of word crossings. Change fonts, add colors and modify layout. Don't settle for a boring black-and-white puzzle. Tired of your puzzles looking like they were printed off a web site? With Puzzle Maker, your printed puzzles will look great - no website logos, no unwanted text. 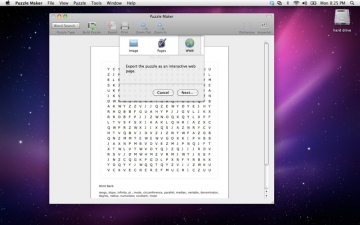 Print your puzzle document in either portrait or landscape layout. Choose from a selection of possible puzzles for the best pick. Export your puzzles to a high quality image (PNG), so they can be included in another document or a website. Need to edit your puzzle document further? 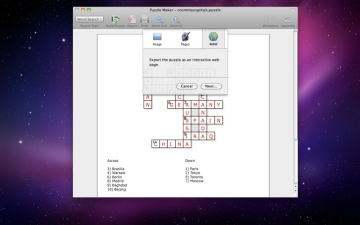 Export your puzzles to Pages, the word processor by Apple. Then you can create books and newsletters that include your puzzle. Works with Pages 5 and later. Want to share your puzzle with the world? Puzzle Maker lets you export your puzzle as an interactive web page, so people all over the world can solve your puzzle. Supports IE9+, Firefox 4+, Chrome, Safari 4+, and Opera 12+. Also works on the iPad and other tablets. Upload your web puzzles to mywordpuzzles.com. 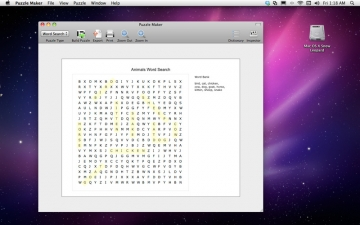 Include interactive word puzzles in your electronic books made with iBooks Author. Play your crosswords in popular crossword players, such as Black Ink by Red Sweater Software. Puzzle Maker takes advantage of your multi-core Mac to deliver a good-looking puzzle, fast. 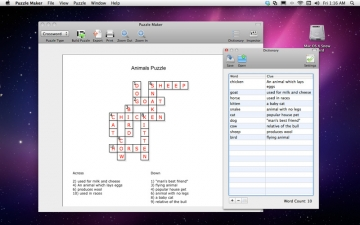 Puzzle Maker is both a crossword puzzle maker and a word search maker. Don't use 2 separate programs: create both type of puzzles from the same word lists! -Checks for accidentally included common "naughty words" in word searches. -Word searches can include a hidden message. -Adjust word search grid width & height. -Choose if you want words to be placed backwards or not.